Everyone must know how to check the fake currency notes in Pakistan. Recently, the State Bank of Pakistan gave a statement about the existence of fake currency notes in the market. According to them some anti-state elements are involved in this illegal practice to harm the national economy. Pakistani currency notes have world’s best security features including geometrical features, electrotype watermarks, rainbow printing, anti-scan areas, cylinder mold and several other hidden features. Pakistani currency notes have a number of security features. All the original banknotes have various security features that you can check easily and quickly. Below are few easy methods to check that either the bank note is original or fake. Genuine currency notes will not change color when viewed under Ultraviolet Light. This is one of the foremost and quickest ways to detect a counterfeit currency note in a bundle. Pass Black light or UV light over currency notes and if you notice a note that is glowing with a bluish tinge, reject that note. Genuine currency note will not change its color. Security thread of Rs.5000 note, on viewing through ultra violet light yellow and blue fluorescent bands may be viewed. 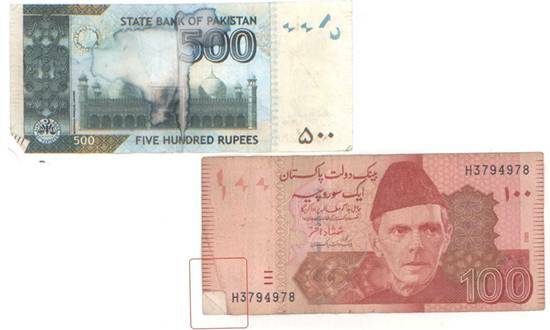 Watermark image of Quaid-e-Azam is found on front left side of the notes when viewed under light behind it. Denomination of note can also be found written in the watermark. This type of watermark is not printed but created by changing the thickness of the paper. In fake notes the watermark is created with opaque ink or stamping a die etc which can be easily checked. In genuine currency notes, the security thread is partially embedded in the banknote paper at the front left side of the note. This thread can never be pulled out. The thread appears a continuous dark line at Rs10, Rs.50 and Rs.100 old design notes; the word ‘State Bank of Pakistan’ may be checked in the thread of Rs.500 and Rs.1000. The words ‘State Bank of Pakistan’ along with ‘denomination numeral’ may be checked at the new design banknotes of Rs.10 and Rs.20 whereas this appears as silver dashes at Rs 5000 banknotes. Counterfeiters either print a dark strip or put a complete strip inside two sheets of paper. There is a flag with crescent moon and a star at front right side of 500, 1,000 and 5,000 currency notes. This is printed with Optical variable Ink (OVI) and changes color from green to magenta and magenta to green, when the note is viewed from different angles. If the flag doesn’t change color when the note is viewed from different angles, the note is fake. The portrait of Quaid-e-Azam and denomination numeral at the obverse is printed in intaglio (raised printing). The tactile lines at the extreme left and right are printed in intaglio. One can easily feel the raised printing by touch at the obverse on each banknote except Rs.10 banknote. The Quaid’s jacket/sherwani will always leave a trace of roughness no matter how old the note is despite wear and tear, though it does become faint with older notes. It comprises of 2 different images, one on the front and the other on the back. Denomination figure of the note in Urdu script appears partly at the obverse left top and partly at reverse right top giving a perfect look when viewed through light. Counterfeiters imitate this feature quite often by printing in a dark and light shade to produce the impact when the note is viewed placed on a surface. However lifting the note for light to stream through will show no change unlike in the genuine note. The paper of Pakistani currency notes is 100% cotton based. The paper will never split in two at the edges like tissue paper does. If you notice that a currency note is splitting at the edges then reject it. The area to the front left side of the note has fine anti-scan and anti-copy lines. These lines can not be scanned or photocopied thus prevent scanning and photo copying of the exact note. These lines magically vanish when the note is photocopied or scanned and then printed. Therefore, if the lines aren’t there you know it’s a fake. Specialized ink is used for printing, which will never smear/ smudge or wipe even if wet. The ink of counterfeit notes generally smudge when wet.